I had a rough idle on my truck. So after researching and getting prices, I decided to just fix the lifter problem myself. I turned the truck over after the valve covers was off so I could see what wasn't moving. It was a rocker on the intake valve. So I needed a new head gasket anyway, so I tore the engine down. The lifter that I suspected did come apart in my hand. So since I did one side, I was going to do the other. Which all in all I ended up deciding that a delete kit would be best. I was talking to another guy with my plans, he was worried that my bottom end could be an issue. I have heard that the 5.3 are pretty strong. Is it possible that the new top end will beat up the bottom end? Hi and welcome to 2CarPros. A new top end shouldn't hurt anything. However, since you are this far, I would suggest going the extra mile and replacing rod and main bearings. I would at least suggest checking the crank and bearings. Also, since you had a lifter issue, make sure the camshaft wasn't damaged. Here are the directions for inspecting the crankshaft and camshaft. All attached pictures correlate with these directions. Important: Use care when handling the crankshaft. Avoid damage to the bearing surfaces or the lobes of the crankshaft position (CKP) reluctor ring. Damage to the teeth of the CKP reluctor ring may affect on-board diagnostics (OBD) II system performance. 1. Clean the crankshaft with solvent. 2. Thoroughly clean all oil passages (2) and inspect for restrictions or burrs. Caution: Refer to Safety Glasses Caution. 3. Dry the crankshaft with compressed air. Important: The reluctor ring teeth should not have imperfections on the rising or falling edges. Imperfections of the reluctor ring teeth may affect OBD II system performance. 1. Inspect the CKP reluctor ring teeth (1) for damage. 2. Inspect the crankshaft journals for wear. Journals should be smooth (1) with no signs of scoring, wear, or damage. 3. Inspect the crankshaft journals for grooves or scoring (2). 4. Inspect the crankshaft journals for scratches or wear (3). 5. Inspect the crankshaft journals for pitting or imbedded bearing material (4). 6. Inspect the crankshaft rear oil seal surface (5) for grooves or scoring. 7. Inspect the crankshaft key (122), keyway (1), and threaded hole (2) for damage. 8. Measure the connecting rod journals for out-of-round and taper. 9. Measure the crankshaft thrust wall width. A crankshaft with a thrust wall width in excess of 26.2 mm (1.0315 in) (a) must be replaced. 10. Measure the crankshaft runout. Use wooden V-blocks or a fixture to support the crankshaft on the front and rear journals. 11. Use the J 7872 in order to measure the crankshaft runout at the front and rear intermediate journals. 12. Use the J 7872 in order to measure the runout of the crankshaft rear flange. 13. Use the J 7872 in order to measure the runout of the crankshaft position reluctor ring. Reluctor ring runout should be measured 1.0 mm (0.04 in) below the ring teeth. If the reluctor ring has runout in excess of 0.7 mm (0.028 in), replace the crankshaft. 14. Inspect crankshaft bearings for craters or pockets. Flattened sections on the bearing halves also indicate fatigue. 15. Inspect the crankshaft bearings for excessive scoring or discoloration. 16. Inspect the crankshaft bearings for dirt or debris imbedded into the bearing material. 17. Inspect the crankshaft bearings for improper seating, indicated by bright, polished sections of the bearing. If the lower half of the bearing is worn or damaged, both upper and lower halves should be replaced. Generally, if the lower half is suitable for use, the upper half should also be suitable for use. * The crankshaft main bearings are a precision insert type. Main bearing caps are machined with the engine block, for proper clearance, and cannot be shimmed or filed for bearing fit. If the clearances are found to be excessive, new bearings and/or engine block and cap repair or replacement may be required. * Do not rotate the crankshaft while gaging plastic is between the crankshaft journal and the bearing surface. * The crankshaft bearing clearances are critical. Excessive bearing clearance may affect crankshaft position sensor signals and may affect OBD II system operation. 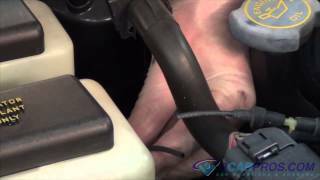 * Remove the bearing cap side bolts prior to cap removal. Remove the bearing caps, bearing half, and bolts. 2. Install gaging plastic onto the crankshaft journal. Install the gaging plastic the full width of the crankshaft bearing journal. 3. Install the bearing caps, bearing half, and bolts. 4. Remove the bearing caps, bearing half, and bolts. 5. Using the scale supplied with the plastic gaging kit, measure the gaging plastic at its widest area. * If the gaging plastic shows irregularity in the journal, exceeding 0.025 mm (0.001 in), remove the crankshaft and measure the journal with a micrometer. * If clearance cannot be brought to specifications, replace the crankshaft or engine block as required. Refer to Engine Mechanical Specifications (RPO LY5 VIN J) Engine Mechanical Specifications (RPO LC9 VIN 3) Engine Mechanical Specifications (RPO LY2 VIN C) Engine Mechanical Specifications (RPO LH6 VIN M) Engine Mechanical Specifications (RPO LMG VIN 0) Engine Mechanical Specifications (RPO LY6 VIN K) Engine Mechanical Specifications (RPO L76 VIN Y) Engine Mechanical Specifications (RPO L92 VIN 8). * Connecting rod bearings are a precision insert type. Connecting rods are of a powdered metal design and cannot be shimmed or filed for bearing fit. If clearances are found to be excessive, a new bearing and/or connecting rod is required. Remove the bearing cap, bearing half, and bolts. 2. Install the gaging plastic onto the connecting rod bearing journal. Install the gaging plastic the full width of the journal. 3. Install the bearing cap, bearing half, and bolts. 4. Remove the bearing cap, bearing half, and bolts. 5. Using the scale supplied with the plastic gaging kit, measure the gaging plastic at its widest area. Refer to Engine Mechanical Specifications (RPO LY5 VIN J) Engine Mechanical Specifications (RPO LC9 VIN 3) Engine Mechanical Specifications (RPO LY2 VIN C) Engine Mechanical Specifications (RPO LH6 VIN M) Engine Mechanical Specifications (RPO LMG VIN 0) Engine Mechanical Specifications (RPO LY6 VIN K) Engine Mechanical Specifications (RPO L76 VIN Y) Engine Mechanical Specifications (RPO L92 VIN 8). j 43690 and J 43690-100 have been developed as a more accurate method to measure connecting rod bearing clearances. The instructions below provide an overview of tool set-up and usage. For more detailed information, refer to the tool instruction sheets supplied by the tool manufacturer. Important: The crankshaft must be secure, with no movement or rotation, in order to obtain an accurate reading. 1. Rotate the crankshaft until the journal/connecting rod to be measured is in the 12 o'clock position. 2. Remove a bearing cap and bolts (1). 3. Remove the bearing half (2). 4. Insert a piece of paper card stock onto the crankshaft journal. 5. Install the bearing half (2) and cap and bolts (1). 7. Install the swivel base (1) and dial indicator (2). 8. Adjust per the manufacturers instructions and measure the connecting rod bearing clearance. 1. Clean the components in solvent. Caution: Refer to Safety Glasses and Compressed Air Caution. 2. Dry the components with compressed air. 3. Inspect the camshaft bearing journals (1) for scoring or excessive wear. 4. Inspect the camshaft valve lifter lobes (2) for scoring or excessive wear. 5. Inspect the threaded bolt hole (3) in the front of the camshaft for damaged threads or debris. 6. Inspect the camshaft sprocket pin (204) for damage. 7. 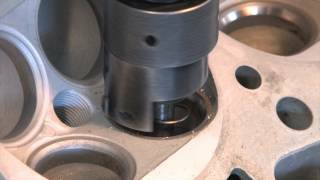 Inspect the camshaft retainer plate for wear or a damaged sealing gasket. If the camshaft retainer plate sealing gasket is not cut or damaged, it may be used again. 8. Inspect the camshaft bearings for proper fit in the engine block. Camshaft bearings have an interference fit to the engine block and should not be loose in the engine block bearing bores. 9. Inspect the camshaft bearings for excessive wear or scoring. Bearings with excessive scoring or wear must be replaced. 10. Using a micrometer, measure the camshaft journals for wear and out-of-round. * If the camshaft bearing journals are greater than 0.025 mm (0.001 in) out-of-round, replace the camshaft. * If the camshaft bearing journal diameter is less than 54.99 mm (2.164 in), replace the camshaft. 11. Using a micrometer, measure the camshaft lobes for wear. Refer to Engine Mechanical Specifications (RPO LY5 VIN J) Engine Mechanical Specifications (RPO LC9 VIN 3) Engine Mechanical Specifications (RPO LY2 VIN C) Engine Mechanical Specifications (RPO LH6 VIN M) Engine Mechanical Specifications (RPO LMG VIN 0) Engine Mechanical Specifications (RPO LY6 VIN K) Engine Mechanical Specifications (RPO L76 VIN Y) Engine Mechanical Specifications (RPO L92 VIN 8). 12. Measure the camshaft runout. 1. Mount the camshaft in wooden V-blocks or between centers on a fixture. 2. Using the J 7872, measure the runout of the intermediate camshaft bearing journals. 3. If camshaft runout exceeds 0.05 mm (0.002 in), the camshaft is bent and should be replaced. Important: Measuring camshaft lobe lift is a procedure used to determine if the camshaft lobes have worn. This test is to be performed prior to engine disassembly and with the camshaft and valve train components installed in the engine. 1. Using the J 8520, measure camshaft lobe lift. 2. Remove the valve rocker arms and bolts. 3. Install the dial indicator mounting stud into the valve rocker arm bolt hole. 4. Assemble the components of the J 8520 and position onto the stud. 5. Position the shaft of the dial indicator onto the end of the pushrod. 6. Rotate the face of the dial indicator to zero. 7. Slowly rotate the crankshaft clockwise, until the dial indicator obtains its highest and lowest readings. 8. Compare the total to specifications. Refer to Engine Mechanical Specifications (RPO LY5 VIN J) Engine Mechanical Specifications (RPO LC9 VIN 3) Engine Mechanical Specifications (RPO LY2 VIN C) Engine Mechanical Specifications (RPO LH6 VIN M) Engine Mechanical Specifications (RPO LMG VIN 0) Engine Mechanical Specifications (RPO LY6 VIN K) Engine Mechanical Specifications (RPO L76 VIN Y) Engine Mechanical Specifications (RPO L92 VIN 8). I hope this helps. Let me know if you have other questions or need help with anything. Thank you so much. Thank you for taking the time to put this all together. Will definitely print this all off. Thank you again. You are very welcome. If you need removal and replacement information, torque specs or anything else, let me know. Also, consider replacing the timing chain and gears. I'm sure they have a lot of wear. If you were burning oil or using an excessive amount, consider checking cylinders for wear when you have the heads off. Again, if you need information, let me know. My 97 Gmc Sierra Has A Really Rough Idle And It Dies When You Stop At A Lighht. What Could Thhat Be?